UPDATE 9/10: Federal climate forecasters now peg the odds of a winter-long El Niño event at 95 percent and indications persist that it could be the strongest on record, eclipsing even the 1997-98 “Godzilla” event that produced huge amounts of precipitation in California. NOAA says right now, the current El Niño ranks third in strength on the all-time list, with 1997-98 still at the top. State water managers have openly fretted that El Niño “hype” could undermine water conservation efforts, and continue to caution that even an unusually wet winter would not reverse the current drought on its own, and a return to drought conditions in subsequent years is also quite possible. -- Ed. The tropical Pacific has taken a circuitous path over the past several years toward its present extraordinary warmth. El Niño — a pronounced warming of the equatorial eastern Pacific Ocean, which occurs at odd intervals —had been largely absent over the past 15 years. Following the record-strength El Niño event in 1997-1998, the tropical Pacific calmed down quite a bit, entering a persistent “La Niña-like” state characterized by unusually warm conditions in the tropical West Pacific and unusually cool conditions in the east. These anomalous ocean temperatures substantially altered global weather patterns, and there’s even evidence that the Earth’s average air temperature increased more slowly that it would have otherwise due to global warming as a result of the large amount of energy being sequestered by the warm West Pacific. 2014 brought a bit of a “false start." Despite real-world observations and ocean-atmosphere model predictions that pointed toward a strong El Niño, the ocean and atmosphere ultimately didn’t cooperate. The resulting “El Wimpo” did act to spread extraordinary warmth all around the North Pacific, which helped to make 2014 the warmest year on record globally (and in California). But the typical atmospheric effects of El Niño—which are often felt all around the Northern Hemisphere—never materialized. This year, however, things couldn’t be more different. Recent observations strongly agree with model forecasts of a powerful and strengthening El Niño event in the Pacific. Indeed, warmth of the eastern tropical Pacific has recently reached values only seen previously during the strongest El Niño on record in 1997-1998. 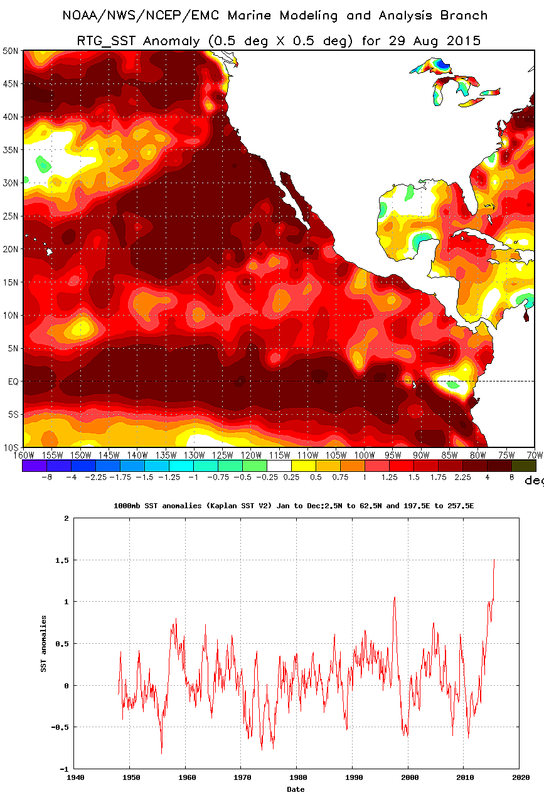 In fact, the North Pacific Ocean is presently warmer than it has ever been in recorded history. 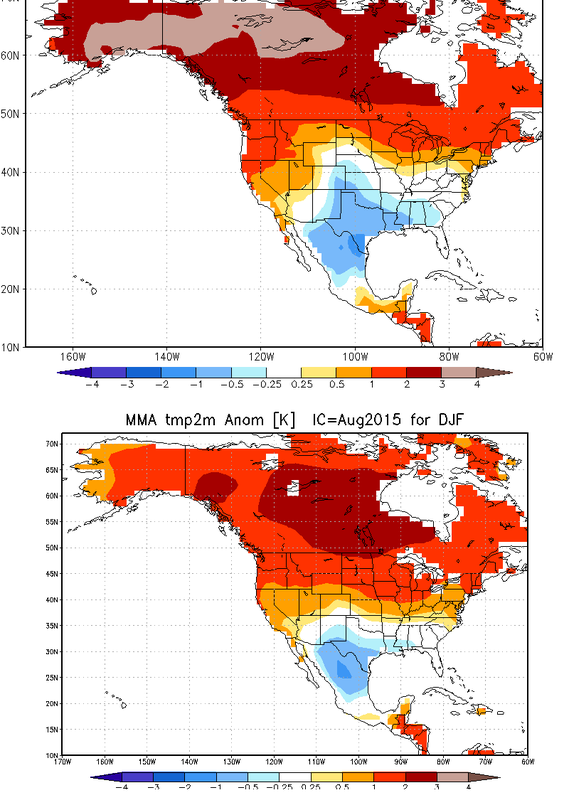 The atmosphere, too, has gotten its act together this time around—and is exhibiting strongly El Niño-like behavior. In fact, the combination of a powerful El Niño event and the sudden re-emergence of accumulated heat from the tropical West Pacific has created unprecedented warmth over a vast expanse of ocean, stretching thousands of miles from coastal Peru to the Gulf of Alaska. A wetter and warmer-than-average winter is likely for most or all of California in 2015-2016, and there may be an increased risk of flooding in some regions. Managing the impacts of simultaneously-occurring record El Niño and record drought in California will be challenging. Ocean-atmosphere model forecasts remain nearly unanimous — as they have been for several months — in predicting a top-tier El Niño for the upcoming autumn and winter months. Since ocean temperature anomalies in a closely-watched patch of the Pacific known as the Niño 3.4 region are now above +2 C — and not too far from their highest values ever observed at any time of year — current observations in the real world suggests that the model projections are very much on track. Right now, an “ensemble” consisting of major national and international climate models suggests a high likelihood that the present El Niño will eventually become the strongest on record, surpassing 1997-1998 in terms of ocean temperatures in the equatorial Pacific. Even if this event does not become the superlative event in the historical record, it’s virtually certain that it will end up in the top three. Because the atmosphere has responded in a strong and coherent way to these extremely high ocean temperatures already, there is high confidence among scientists that El Niño will persist through the coming winter. Weak to moderate El Niño events can have highly variable effects in California, and are in most cases poor predictors of how much precipitation might fall in the Golden State. But the big events are a whole different ballgame, and the presence of a powerful El Niño in the tropical Pacific is the single most useful piece of information we have regarding what might take place in the months to come. While even a record-strength El Niño in the tropical Pacific does not mean that California will experience record rains this winter (there are always other factors at play), it does strongly shift the odds in favor of a wet winter. Predictive tools depict a “classic” El Niño winter pattern along the West Coast of North America, with much below-average precipitation in the Pacific Northwest and British Columbia and much above-average precipitation over essentially all of California. Expect warmer-than-average temperatures along essentially the entire West Coast as the region of above-average ocean temperatures persists along the immediate coast. Death of the Ridiculously Resilient Ridge? Scientists are still working to determine precisely what confluence of conditions allowed for the extraordinary multi-year persistence of the Ridiculously Resilient Ridge, which fostered California’s ongoing drought by deflecting the winter storm track. But one fundamental driver of the "Triple-R’s" longevity appears to have been the persistent warmth of the western tropical Pacific Ocean — warmth that is rapidly dissipating as El Niño warms the east at the expense of the west. Because this primary cause of the Triple-R is no longer present, it’s unlikely that we’ll see yet another winter of unrelenting high atmospheric pressure over the Pacific. Model predictions agree with this assertion, and are currently hinting that we’re far more likely to witness the development of a "Truly Tenacious Trough" this winter than a return of the Ridiculously Resilient Ridge. The drought paradox: feast AND famine? 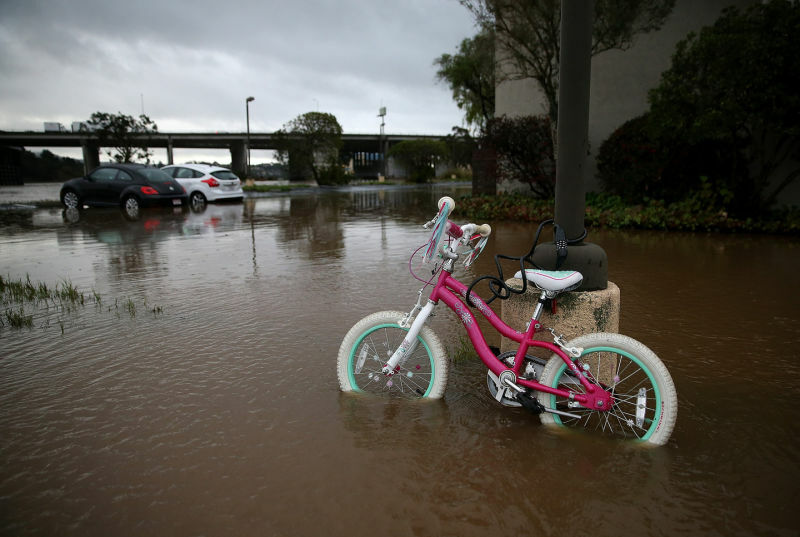 Major winter flood events can occur in California in any given year, El Niño or not. However, the present very strong El Niño will likely bring the potential for more frequent and stronger winter storm systems than would typically occur. Water temperatures along the Pacific coastline are also expected to remain very warm through the coming winter, which will likely increase the amount of atmospheric moisture available to California-bound storms. This suggests that there could be a substantially increased risk of precipitation-related hazards this winter in California, including flooding and landslides. 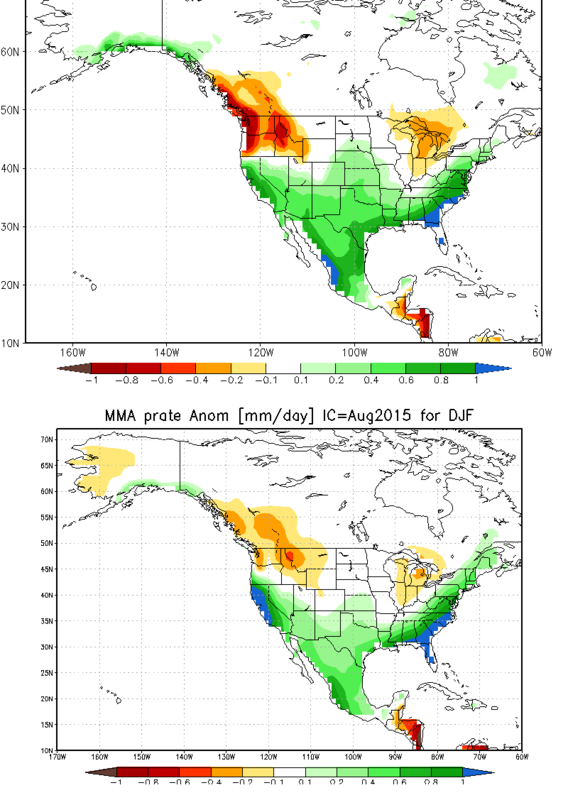 Another potentially aggravating factor will be the lingering effects of California’s severe drought. Burn scars from intense wildfires in recent years cover hundreds of thousands of acres of the California landscape, and these regions will be profoundly vulnerable to debris flows and landslides as a result of the decreased permeability of scorched soils. Considerable drought-related tree mortality — both in natural forest stands and also in urban areas — may worsen the impacts of winter storms this year. Drought-killed (or weakened) trees will topple more easily during periods of strong winds, presenting hazards in and of themselves but also increasing the debris load in river and stream channels across the state. At the same time, California’s multi-year precipitation deficits remain so large (equivalent to 1-2 years’ worth of precipitation) that it would be essentially impossible to make up the difference in a single year. It’s plausible that many of the state’s major reservoirs will be in substantially better shape after the coming winter, and that short-term drought indicators will improve quite a bit—which would be very good news, indeed. But it would take an extended sequence of cool, wet winters to meaningfully replenish depleted groundwater aquifers, improve upon the truly abysmal Sierra Nevada snowpack in recent winters, and alleviate some of the long-term ecosystem impacts of California’s ongoing record “hot drought.” Unfortunately, such an outcome doesn’t appear to be in the cards. Daniel Swain is a climate scientist at Stanford University. A longer version of this post appears on the California Weather Blog, where you'll find all of his previous posts.